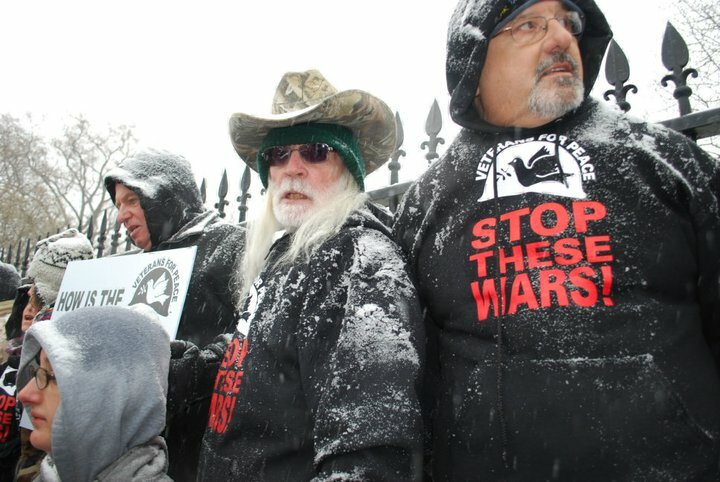 Dozens of activists, including the man who leaked the Pentagon Papers on the Vietnam War, were arrested Thursday at the White House as they protested the Afghanistan conflict and defended WikiLeaks. As President Barack Obama unveiled a war review strategy inside, more than 100 war opponents — many of them veterans — marched through snow to the White House, chanting “Peace now!” and refusing to step down from the fence’s ledge. Police waited before gradually sealing off the area and escorting remaining protesters — who had vowed to stay until their arrest — into two waiting buses. Daniel Ellsberg, who as a government consultant leaked the Pentagon Papers that revealed war planning in Vietnam, saluted Bradley Manning, the young army officer suspected of leaking secret US documents to website WikiLeaks. “I’m afraid that will happen indefinitely unless more people follow the example of Bradley Manning, whose courageous act of civil disobedience probably confronts him with life in prison,” Ellsberg said to cheers. Medea Benjamin, co-founder of the Code Pink women’s peace movement, noted that Afghanistan ranks near the worst in rankings on development and corruption despite billions of dollars a month in the US war effort. 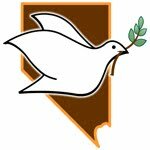 “It is high time that President Obama get a clue and understand that we need, as our signs says here, a real peace president,” she said. “We need men that understand that the best thing we can do for our security and the security of the people of Afghanistan is to take the money that we are spending on war and invest it in people, invest it in health care, invest it in education at home and in Afghanistan,” she said. Obama, an early opponent of the Iraq war, has tripled troop numbers in Afghanistan but pledged to start a withdrawal next year. The United States sent troops to Afghanistan in 2001 after the September 11 terrorist attacks carried out by Al-Qaeda, which had found sanctuary in Taliban-ruled Afghanistan. In the review, Obama said there was “significant progress” in curbing the Taliban and stifling Al-Qaeda, but warned more time was needed. 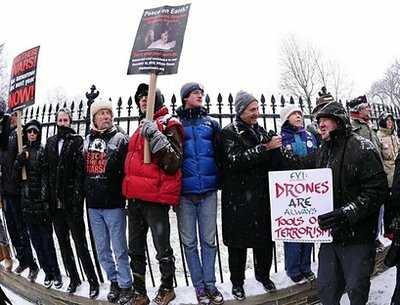 On Thursday, author, Pulitzer Prize-winning journalist and Truthdig columnist Chris Hedges and Pentagon Papers whistle-blower Daniel Ellsberg were among the 131 anti-war activists arrested during a nonviolent demonstration outside the White House to protest against the war in Afghanistan as well as America’s ongoing conflicts in Iraq and Pakistan. 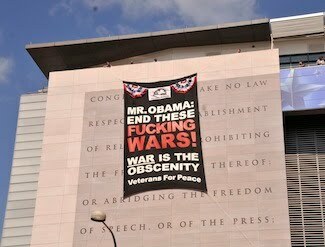 On October 2nd 2010, Veterans For Peace hung banners inside and on the outside of the Newseum in Washington, DC. See the photo and film here. No one got arrested, the banners were returned, and as you can see it attracted a lot of attention! Our culture views the “f”-word as vulgar and offensive—even obscene, yet accepts the “w”-word with no such sense of revulsion. Outside the racetrack… war is a bad bet. Minnesota veterans stood in solidarity with veterans from Saratoga Springs and Albany New York as they protested the war at the Saratoga Springs race track’s 142nd opening day. 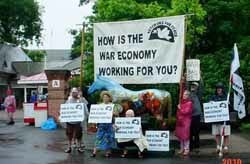 Veterans for Peace members stood in pouring rain with banners and placards that asked the question “How’s the War Economy Working for You?” The Saratoga Race Course reopened Friday after nearly going bankrupt in 2008. As racing fans paused to buy tip sheets at the race course gates, veterans chanted “War is a bad bet! and were handed brochures that asked folks “How is the War Economy Working for You?” Some race goers stated they had thought the war economy would bring prosperity, but were disappointed with the war’s multi-billion dollar drain on the economy. Among the protesters were Minnesotans Coleen Rowley, one of Time Magazine 2002 Persons of the Year and a former FBI staff attorney, Jack Rossbach of International campaign to Ban Land Mines and Cluster Munitions, and Kim Doss-Smith of Women Against Military Madness, plus a few members of Twin Cities Chapter 27 of Veterans for Peace. They are members of a delegation of 19 Minnesota peace activists that are in Albany New York attending a national conference and strategy planning session of the national peace movement.